Have you ever noticed how clear the night sky looks in winter? There's actually two reasons why--the first is that colder temperatures make it harder for the atmosphere to hold moisture and the second is that we (in the northern hemisphere) face the outside spiral arm of the Milky Way galaxy in the winter. In the summer we face the center of the galaxy which is far more dense with stars. These two effects combine to create vivid night sky viewing conditions in the winter. I'm fascinated by the universe and stargazed regularly growing up in upstate New York; a hobby that eventually led to studying Physics and Astrophysics in college. I know. I pivoted. Hard. After the production madness surrounding the holiday retail season I needed to work on a passion project to bring me back to sanity. I notice the superior stargazing conditions every winter and wanted to design a mug that captures that beauty. One of my favorite techniques is sgraffito--carving a surface away to reveal a surface with a contrasting color beneath--and it's perfect for creating the effect of point-like sources of light shining through a vacuum of darkness. I throw each mug starting with a cylinder of porcelain clay on the wheel. After drying for a few days in a damp environment, I trim it on the wheel to smooth and remove excess weight from the bottom. Before I start trimming I pull handles for all of the mugs so they can dry while I trim. Once all the mugs are trimmed and the handles have dried to leather hard, I attach each handle by hand to the cylinder by scratching the joints and "glueing" the pieces together with slip (liquid clay). I wanted to leave the exterior unglazed for a rougher texture on the hand so I made slip with the same porcelain clay and dyed it with black mason stain. 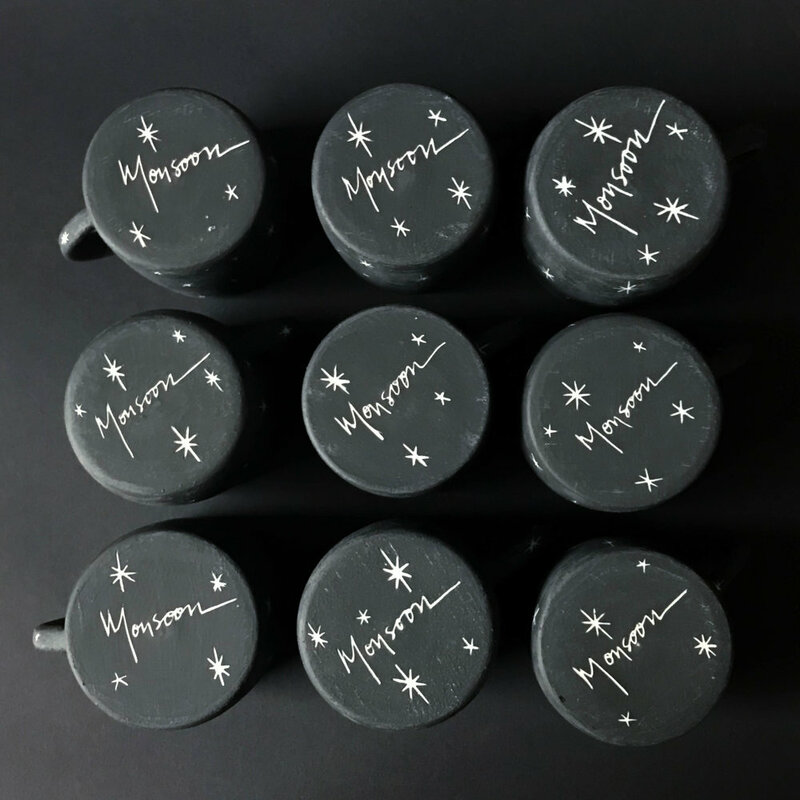 I painted three coats of this black slip on each mug. 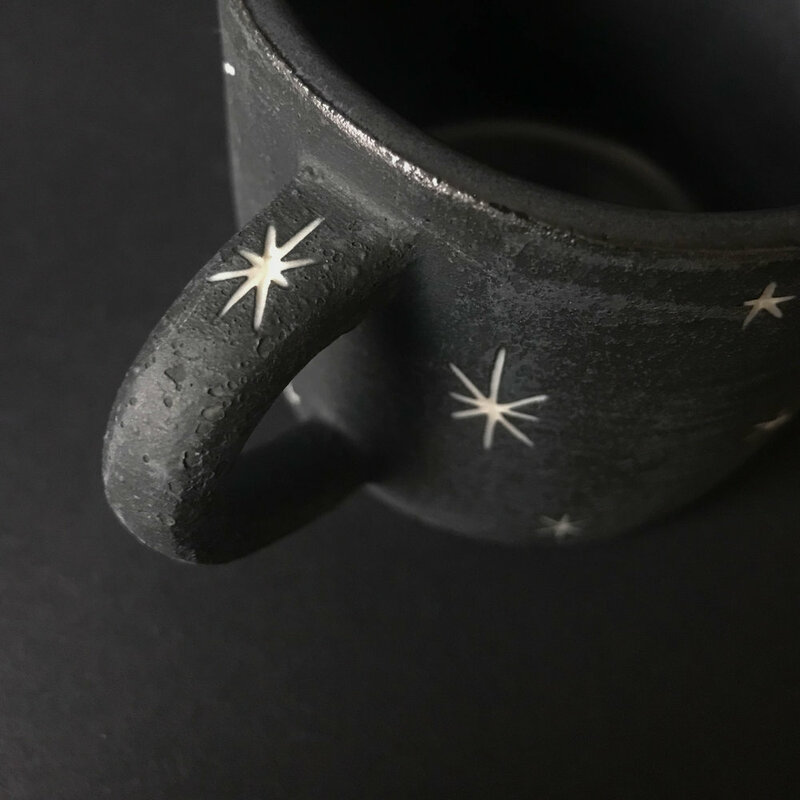 Once they completely dried, I etched the stars into the mugs to reveal the white porcelain beneath the black slip. Each one signed. Each one unique. I tried to carve stars on every handle. The process from here is pretty standard. The mugs were bisque fired to 1830 degrees Fahrenheit and then I applied a silky black glaze only on the interior. Then I fired them a second time to 2350 degrees Fahrenheit to finish. When I took the mugs out of the kiln I noticed some bubbling on the unglazed exterior where I applied the black slip. This is a sign that my mason stain concentration was slightly too high; however, after sanding the exteriors down, it created a very interesting crater texture. If the moon were small enough to hold in your hand, I like to think it would feel like these mugs. Like all Monsoon Pottery wares, these mugs were a labor of love and totally worth it.